Why Is it So Cold???!!!! Anyone who lives in the north-central United States, or most areas of Canada, can agree with me here: Spring and summer have been incredibly cold this year. There was a reason, as he explained. And it’s incredibly cool (to me at least) and in no way proves that global warming is all wrong. Let’s help the story along with a map, courtesy of World Atlas (doodles and arrows are my own). The jet stream (the black curvy line on the map) is the boundary between the cold polar winds and the warmer temperate winds. In the Northern Hemisphere, when the jet stream is south of you, your area will be cold. When it is north of you, it’ll be nice and warm. The northwestern Pacific has been warm this spring and summer. This warmth is pushing the jet stream further north. BC is experiencing the effects of this change – it’s had unseasonably hot, dry conditions, which are aggravating their already-worrisome forest fire problem. When the jet stream peaks northward, the prof explained, it has to follow that with a trough. The peak on the West coast was very strong, so the trough further eastward, in the continental US and Canada, has also been very strong. Areas as far south as Chicago have had many days where the jet stream is south of them, so they’re submerged in polar air. 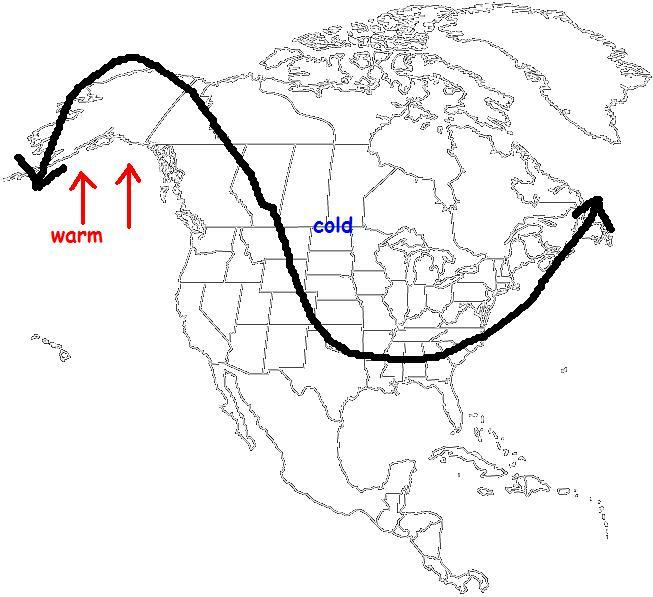 So all spring and summer, the jet stream has been “stuck” in the (very approximate) shape you see above. As an El Niño just began, our area would usually expect a warm winter. However, should the jet stream stay stuck in this shape…..we might have a colder winter than normal. The Prairie winters are bad enough already. I can only imagine the “so much for global warming” comments which would happen if such a winter came to pass. So, in a strange way, our area has been so cold because somewhere else has been really warm. This can’t prove that the Earth is warming, as no single event can. But it certainly doesn’t disprove it.